Who would've thought Tom was so cunning. Performance White Ford Mustang GT Convertible, Turbo-Charged, 450 RWHP! You forgot; Gently Used, Mature Driver, Seen Little Boost. Okay, maybe the last one will throw up the flag. Who are you calling mature?? We won't recoupe as much as we put into them, but a lot more than a dealer trade. For me, hope that times doesn't come soon. That would be a real pi$$er after all the modding I've done. Unless of course I came into some major bank, then I'll trade up to the GT500KR! The plan is afoot. I told her I decided to go tomorrow and she's thrilled! Thats good Tom, I like it!!!! And the word to the Mrs. you will go on the trip tomorrow is a mood setter, a good mood setter! And so it begins.... MWAHAHAHAHAHA! Just a suggestion here, but if any of US yahoos here want to go road racing with the kind of HP we're putting down (Jed...), may want to think about signing up here first. Bill- I'm using your how-to on the spring install right now. Hopefully pics to come later. Looks like it's a on the turbo! I'm still going to talk with them more before I order. I know I have to cut up the H-Pipe and change injectors. If that's the hardest part of the install it'll be a piece of cake. I was worried that welding would be involved, but I guess not from looking at the instructions. With the bigger injectors (39lbs) and the tune, it'll keep the engine safe... but I want to ask about the clutch. Jed - is yours manual or auto? If manual, do you still have the stock clutch? Nothing is said in the install about having to change the clutch to handle the power - in fact, it states no engine mods have to be done with the 8psi kit I would get. The injector change is actually an option. But, then how is gas-mileage affected? He told me the car acts just like a naturally-aspirated engine when driving around normally and during highway cruising. But, I don't want my gas mileage to drop from in the 20's down to 15 or something like that. I'm surprised I didn't hear about this. That track is only about 30 miles away from me. Hi Tom my car has the stock 5 speed in it and the clutch assembliy is all stock. There doesn't seem to be a problem right now with launch, only time will tell how these parts hold up. I think keeping things below 450 RWHP is a wise thing. I have 432 @ the RW and it's suprising each time I drive the car how much torque there is. It's like unleasing the devil! That KB kicks in in at any range and your at WARP speed. CenterForce ,Spec and Fidanza make great after market driveline parts. I may look at this down the road as my driving habits become more aggressive or if I bulid the internals. In that case the driveline will need an upgrade for sure. FYI I use 39lbs injectors also, for most applications this is fine until you start to boosting above 12 psi. This isn't really a hard rule but that's what a lot of technitions have told me. I would stick with 39lbs and try it for a while. I think how you drive will influence gas milage more than an injector upgrade. If you go higher check with tech's and people who have done it first check the performance gain, is worth the cost and overalll gas mileage. I can't wait to see your mod! P.S. 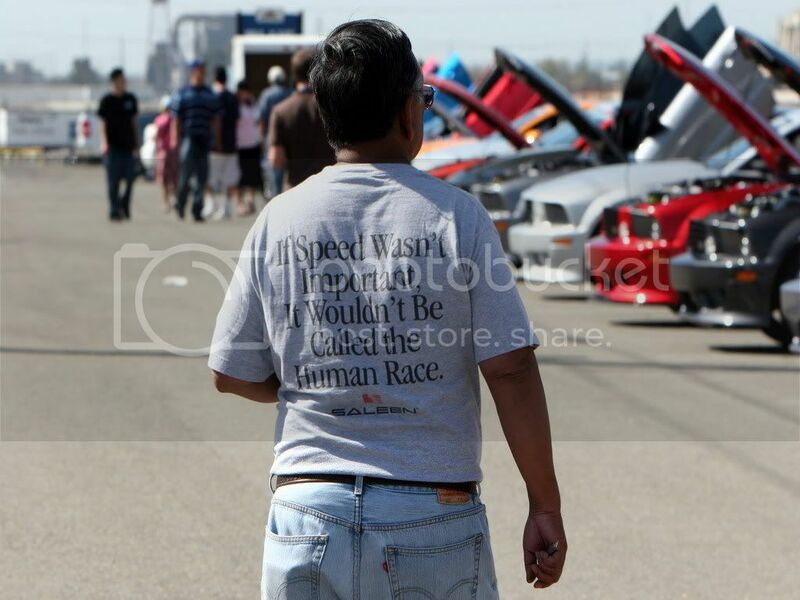 I think this guys T-Shirt sums it up for us performance geeks! Thanks for the input! From reading the install, they actually keep it at 7psi, so I won't be over 450 RWHH. From reading through threads here, 7-8psi on a turbo is equivalent to 9-10psi on a supercharger. Maybe because superchargers have to rob some HP to run? Glad to hear you have the stock clutch. I don't plan on drag racing or many "hard launches", so hopefully the stock clutch would last me a long time. I can't wait to see it, too! Tom good sell job! I think your prudent in taking your time, slow and steady wins the race. Research and knowledge wins the race also in my eyes. I know we haven't met in person but from what I've read, what you have done in the past and your overall mechanics abilities and accomplishments seems like you should have no issues with installing this set up yourself. I would place you in the upper class of mechanics and mechanical ability type people. You are one sharp dude pal! And I know there are many, very many here who think the same. Pat yourself on the back, you've earned it. I would look for help getting it fine tuned once its installed, even if they give you a canned tune. We all know each engine is its own wonder and tweaking is probably a good thing to do for a whole bunch of overall needs. I'm jealous in a good way for you pal, I wish I could figure out what I could sell, barter, trade to get the $ to buy a SC or Turbo. Its all good Tom, slow goes it but when you have it installed giddy up, let the fun begin.